Well, that what it was. We had citizens of Finland, Estonia, Latvia, Italy, Czech Republic, Germany, Poland, Iran, Wales, England, Scotland, (and probably a few I have forgotten) with a much higher proportion female than ever before. The beginners’ session at Dunmore started late due to morning rain, but was well supported with 40-50 at the crag. It was getting mobbed, so I took a group of 12 who arrived from IMC around to Finbarr wall, which was sheltered and sunny. There were other groups at Brasil Rock etc at the same time. The top ropes at Dunowen were a great success, maybe we could setup more next year? It stayed dry for the barby for a change. Sunday also started wet, but cleared after 9.00, and Pinnacle bay and Brazil got a lot of traffic, before the forcasted rain arrived about 3.00. People were pretty climbed out, so some packed up and went home, while others went to McGrorys for a bite. 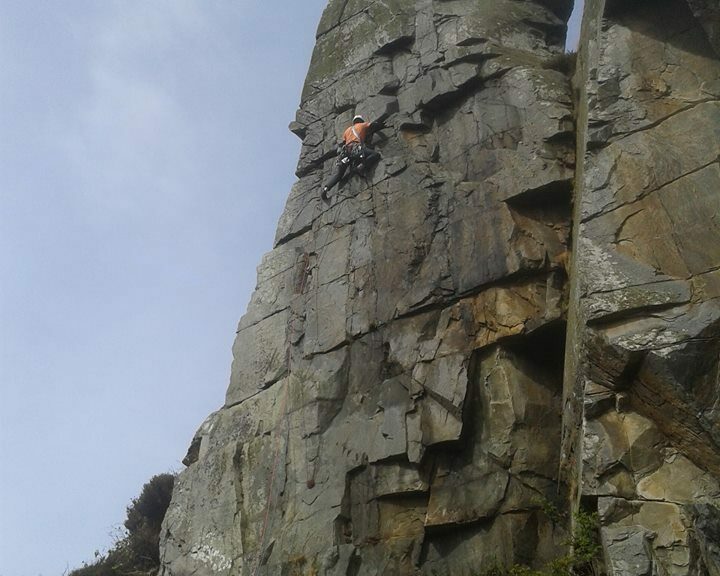 Just a few climbed (plus a couple of late arrivals) on Monday, which was bright and blowy with a few short sharp showers, before the site was cleared. We are missing two kiddies body harnesses, possibly a DMM harness of Anthony’s, a pair of green rock shoes belonging to Valli, a screwgate belonging to Gerard, and I have a couple of harnesses I don’t recognise in the kit bag + a 9mm rope possibly Geoffs. Let me know if you have some of this, or are missing anything. A concern was people not wearing helmets, particularly belayers. Whilst the routes had been mostly checked for loose rock, you can never be sure, and particularly so when the climber strays off route. Thanks to everybody who turned up and helped, the feedback I got from all our visitors was great, they all loved it.